How many Dave’s does it take to change a light bulb? It depends where. 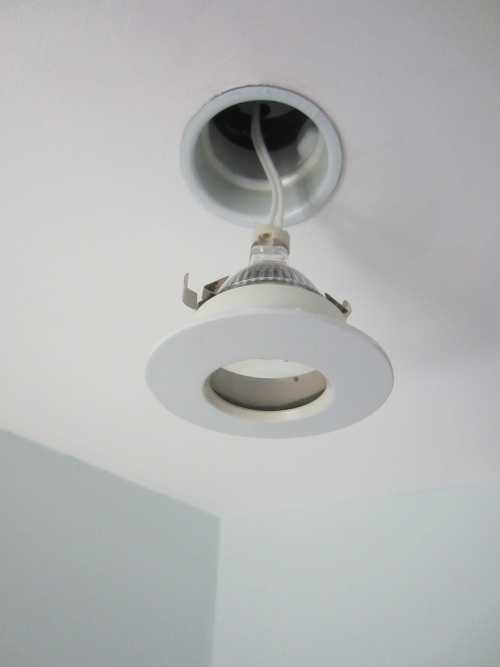 We have some down lighters in one of the bathrooms, and they have damp proof enclosures. Here you can see the internal and external enclosures. 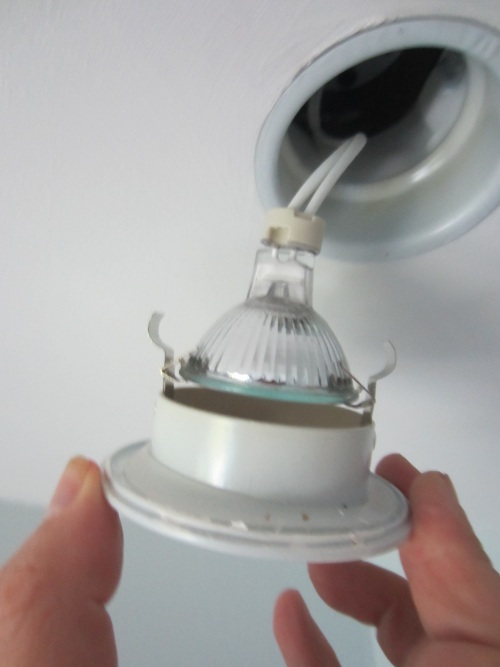 And here you can see the lamp’s attatchment to the lower collar. The spring is quite stiff so the lower plate needs to be pulled and the upper collar needs to be held so that the spring releases the lower collar. The bulk of this snip was written in 2008, much has changed since, although I am still, annoyingly a Sky customer. I updated it in November 2013 when I upgraded the box for free. 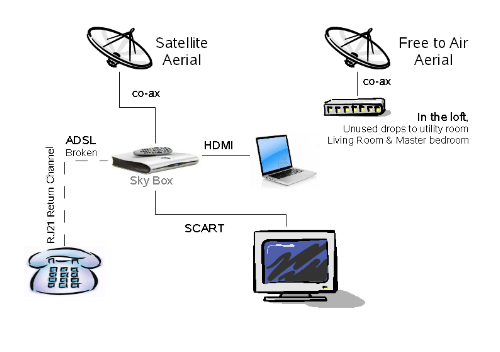 I get Sky, the free-to-air reception is poor where I live and I need to improve my services. The (traditional) ariel on the chimney, is connected via a splitter box to the video receiver and the second TV set. 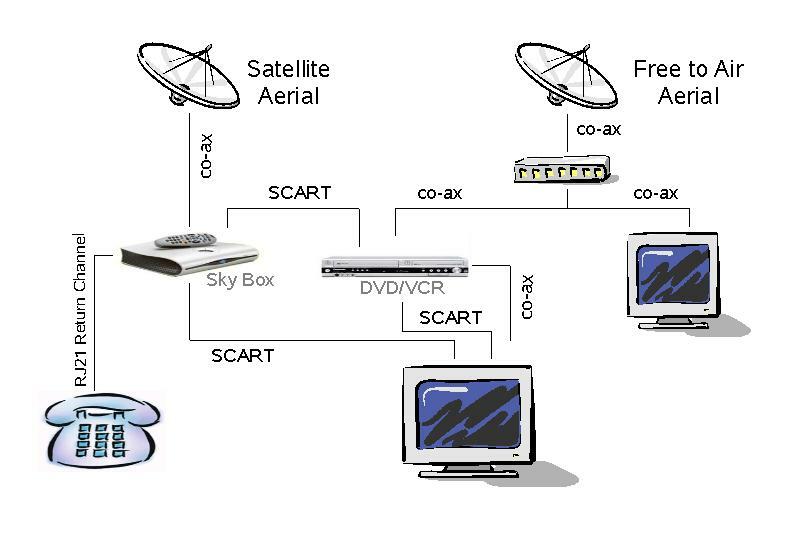 There are three SCART cables, between the three boxes in the room, the TV, Skybox and DVD/VCR. On the 22nd May, the remote control handset for the Skybox gave up. I tested it with three sets of batteries, so it could be the box. I have decided to try and replace the handset. What else might we do? I can consider ‘Freeview’ or ‘Freesat’. Freeview comes over the air, or via Sky. Boxclever state that the quality of the terrestrial digitil signal has probably been improved since we last tested it and costs about ?2.00 for a months rental for a Freeview box. Maybe we should try out the free-to-air Freeview service as a test. The minimum contract is one month, and if it worked it would solve the 2nd TV problem. Freesat would require a new aerial, but is a retail purchase i.e. no subscriptions. It has more channels than Freeview and is claiming to be investing to increase them. No Channel 5, and no Deutsche Welle, but it does include Euronews. Freeview includes Sky News and One, Freesat does not. Boxclever can’t rent us a Freesat box. The BBC have a web page Digital TV without subscription that helps to understand the position. I have no idea what this means for BT Vision, although they said last time I called that Freeview is a pre-requisite. If I propose to take a BT Vision service, I must rationalise my BT services and billing processes.